In 1899, the Chicago & Alton Railway company introduced the Alton Limited, “the handsomest train in the world,” to run an express service between Chicago and St. Louis. It consisted of six Pullman cars built in perfect symmetry: every car was the same length and height, and every window identical. A 1901 issue of The Railway Magazine described it as “a train to be looked at from the outside as well as from the inside.” But there was a problem: how could the company capture the train’s exterior beauty in its entirety? To answer this question, Chicago & Alton called on the photographer George R. Lawrence. Lawrence was an innovator in his field—his Chicago studio branded itself with the slogan, "The Hitherto Impossible in Photography is Our Speciality." By then he was already known for his experiments with flash photography. Later he would go on to photograph the famous aerial view of San Francisco after the 1906 earthquake. Chicago & Alton wanted to know if Lawrence could create an 8-foot-long photograph of the Alton Limited. Lawrence’s first suggestion was to photograph the train in sections, which could then be blended together. Chicago & Alton rejected the idea on the basis that the joins would show and that it would “not preserve the absolute truthfulness of perspective.” So Lawrence proposed another solution, to which Chicago & Alton eagerly agreed: build the world’s largest camera. Lawrence quickly went to work designing a camera that could hold a glass plate measuring 8 feet by 4 1/2 feet. It was constructed by the camera manufacturer J.A. Anderson from natural cherry wood, with bespoke Carl Zeiss lenses (also the largest ever made). The camera alone weighed 900 pounds. With the plate holder, it reached 1,400 pounds. 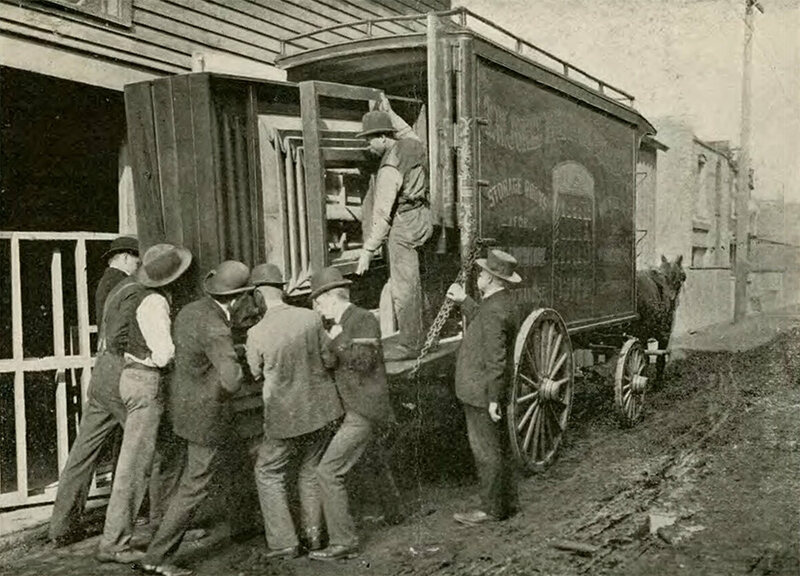 According to an August 1901 article in the Brooklyn Daily Eagle, the bellows was big enough to hold six men, and the whole camera took a total of 15 workers to operate. A team of men also helped to transport the camera, one spring day in 1900, from the studio to a padded van, then a train, and finally to a field near Brighton Park, an ideal vantage point from which to shoot the waiting train. The conditions were clear but windy. After the camera was fully assembled, Lawrence set the exposure to two and a half minutes, and took the photograph. (According to John Wade, author of The Ingenious Victorians: Weird and Wonderful Ideas from the Age of Innovation, four men had to insert the glass plate, and at least six men worked the bellows and lens). Later, using a reported 10 gallons of chemicals, Lawrence developed a clear, crisp, 8-foot-long photograph of the Alton Limited. The timing was fortuitous. Chicago & Alton submitted three prints to the 1900 Paris Exposition, where George R. Lawrence won the Grand Prize for World Photographic Excellence. But the photographs were subject to intense scrutiny. Exposition officials did not initially believe a single camera could create such a large image. Both Lawrence and Chicago & Alton had to submit affidavits to verify that the photograph had been made on one plate. 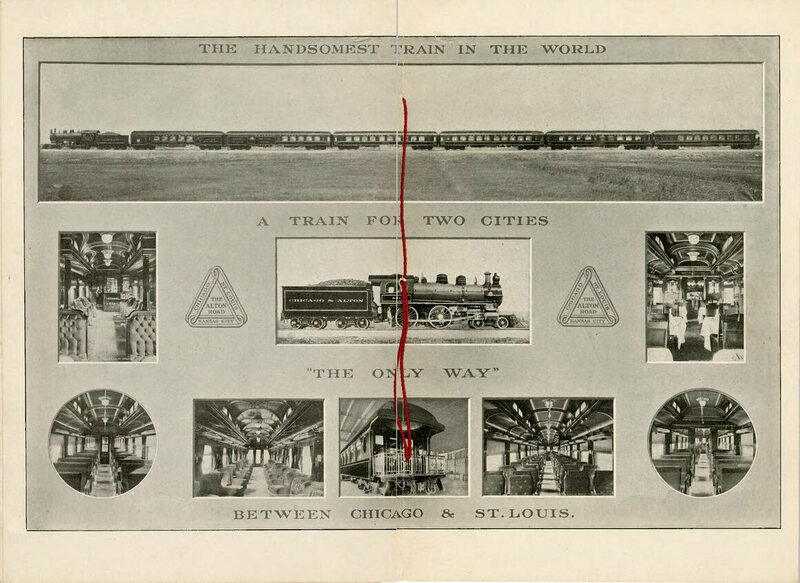 Chicago & Alton now had an irresistible means of promotion, "The Largest Photograph in the World of the Handsomest Train in the World."